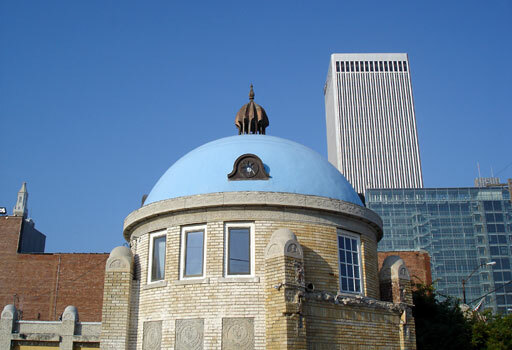 The Blue Dome Historic District is a seventeen-block area that lies just east of the central business district. The majority of the resources are commercial, industrial, and mixed-use buildings. The District includes both small-scale commercial buildings and larger warehouse and industrial facilities, all of which were constructed following the arrival of the Midland Valley and Santa Fe railroads to Tulsa in 1903 and 1905, respectively. The earliest building enclosure dates to circa 1906. Large areas of open space were previously occupied by railroad tracks and spurs; these areas are now used as surface parking. Four railroad spurs remain visible in the District, although more tracks are likely hidden under asphalt or concrete. The third significant transportation system operating in the Blue Dome Historic District was Route 66. The highway, designated in 1926, passed through the Blue Dome Historic District along E. Second Street, S. Detroit Avenue and part of S. Elgin Avenue. A number of gas stations, repair shops and service stations opened along this route to serve traveling motorists. After just seven years the route received a more-direct alignment along E. Eleventh Street that crossed the Arkansas River over the Eleventh Street Bridge. Several auto-related resources associated with the original Route 66 remain, most notably the Blue Dome gasoline station for which the historic district is named. The period of significance (1903 – 1965) begins with the year the Midland Valley Railroad began serving Tulsa (its right-of-way created the open space that forms the heart of the Blue Dome Historic District) and ends with the year the Midland Valley Railroad was sold to the Missouri Pacific Railroad. This period recognizes the important role both the railroads and Route 66 played in the development of the District. The end of the period of significance marks the waning influence of the railroad on the commercial economy of the District. After World War II, construction of the interstate highway system hastened the replacement of railroads in favor of trucking as the preferred method of transporting raw materials and manufactured goods. While the Santa Fe Railroad continues to provide freight service to Tulsa, it no longer operates in the Blue Dome Historic District. The shift began in the 1950s, when the Santa Fe altered its property in the District to reflect the surging influence of truck transport over rail. An aerial photo from 1962 documents the removal of track next to the Santa Fe depot in order to create loading docks for trucks. The sale of the Midland Valley Railroad in 1965 reinforced the shift in transportation preferences and heralded the end of the railroad era in the Blue Dome Historic District. The commercial importance of the Blue Dome Historic District ebbed as the railroads declined, and in 1933 the official route of Route 66 moved south to Eleventh Street, reducing the influence of this highway on this area. The most lucrative period of the Midland Valley railroad ended in 1939. Many oil-related industries in the District survived until the 1980’s oil “bust”, after which various buildings were abandoned or changed use. It was also during the 1980’s that the rails, spurs and sidings were removed, as were the automobile overpasses and underpasses that were no longer needed. Urban Renewal led to the demolition of many small buildings in and around the Blue Dome Historic District and created additional empty space for parking. Despite these changes, the Blue Dome Historic District retains a significant collection of buildings that document the history of the area. The Blue Dome Historic District was listed in the National Register of Historic Places on December 13, 2011 under Criterion A for significance in Commerce and Transportation. Its NRIS number is 11000895.